BACKGROUND AND PURPOSE: Although the prevalence of pineal cysts in autopsy series has been reported as being between 25% and 40%, MR studies have documented their frequency to range between 1.5% and 10.8%. The purpose of this high-resolution brain MR imaging study at 1.9T was to determine the prevalence of pineal cysts in healthy adults. MATERIALS AND METHODS: Brain MR images of 100 healthy young volunteers were randomly selected from our International Consortium for Brain Mapping project data base. Cysts were detected as circular areas of isointensity relative to CSF on both 3D gradient-echo T1-weighted and 2D fast spin-echo T2-weighted images. The inner diameters of all visualized pineal cysts were measured, and a criterion of 2.0 mm of the largest inner cross-sectional diameter was used to categorize cysts as being either small cystic changes (<2.0-mm diameter) or pineal cysts (>2.0-mm diameter). RESULTS: Twenty-three percent (23/100) of the volunteers had pineal cysts with a mean largest inner cross-sectional diameter of 4.3 mm (range, 2–14 mm); 13% (13/100) demonstrated cystic changes involving the pineal gland with the largest inner cross-sectional diameter of less than 2.0 mm. There was a slight female predominance. Two subjects with long-term follow-up scans showed no symptoms or changes in the size of their pineal cysts. CONCLUSION: On high-resolution MR imaging, the prevalence of pineal cysts was 23% in our healthy group of adults, which is consistent with previous autopsy studies. Long-term follow-up studies of 2 cases demonstrated the stability of the cysts. The differential diagnosis of simple pineal cysts and cystic tumors, such as astrocytoma, pineocytoma, and pineoblastoma, is crucial for clinical management.7,18 Although there are no reliable diagnostic criteria for the differential diagnosis of such entities, most authors describe the benign pineal cyst as being well circumscribed and usually elliptical, with a slight hyperintensity or a similar signal intensity relative to the CSF on both the T1-weighted image (T1WI) and the T2-weighted image (T2WI).6,19–21 Enhancement of the cyst wall after the administration of a contrast agent is usually incomplete and not useful for the delineation of the extent of the capsule or the determination of the biologic nature of the lesion.22 On delayed contrast-enhanced MR imaging, pineal cysts may be enhanced uniformly as a solid mass.8,23 The mechanism of the uniform enhancement of the pineal cyst is not completely understood. The authors attribute this to either the passive diffusion of the MR imaging contrast agent from the wall of the pineal cyst or the active secretion of the contrast agent by the wall of the cyst. The management of pineal cysts is still controversial.11 Mandera et al11 reported 4 cases of simple pineal cysts, all of which were treated surgically. One patient was symptom-free after surgery; preoperative symptoms in 2 patients cleared, except for light headaches. However, no improvement was seen in 1 of the 4 cases. The natural history of the pineal cyst is not completely understood because no studies have been performed to follow the cyst from its appearance to its complete resolution. Nevertheless, some studies demonstrated that pineal cysts are stable during relatively long follow-up periods. Barboriak et al24 conducted a retrospective follow-up study in 32 patients with pineal cysts and other intracranial pathologic lesions. They observed that 75% of cysts remained stable over time, ranging from 0.5 to 9.1 years; 16% decreased in size or regressed completely, whereas 8% increased in size by 2.0–3.0 mm. Tamaki et al20 studied 31 subjects with pineal cysts; in 29 cases, the cysts did not change in size during the follow-up time from 3 months to 4 years. In 2 cases, the cysts spontaneously ruptured and collapsed during follow-up. In another study, Golzarian et al6 followed 12 subjects with pineal cysts; the cysts did not change in size throughout the 1-year follow-up. Finally, Bodensteiner et al17 reported 2 cases of pineal cysts in 27 healthy volunteers; the cysts did not change in size throughout the follow-up period of 6 months. We performed this retrospective study, using high-resolution MR imaging at 1.9T, to determine the prevalence of pineal cysts in healthy adults. Institutional Review Board approval was obtained before the initiation of this study. After the volunteers signed the appropriate consent forms, we performed scans with the use of a 1.9 T MR imaging magnet (Elscint). To determine eligibility for the ICBM study, we collected the subjects' health information, including a list of their past surgeries, allergies, and prescription and over-the-counter medicines, as well as the menstrual history of the female subjects. In addition, a neurologist performed complete physical, neurologic, and psychologic tests. A health screening form, filled out by each potential subject, and the results from the aforementioned health screening form and tests were used to select the subjects for this study. Only those without any history, sign, or symptom of neurologic or psychologic diseases were chosen to participate in the study. We performed T1-weighted gradient echo 3D imaging (TR/TE = 24 ms/6 ms; tip angle = 25°; FOV = 25.6 × 25.6 cm; matrix size = 256 × 256; section thickness = 1 mm; number of average = 1) and T2-weighted fast spin-echo imaging (TR/TE = 4200 ms/128 ms; echo-train length = 14; FOV = 25.6 × 25.6 cm; matrix size = 256 × 256; section thickness = 2 mm; number of average = 1; gap = 0). An MR imaging contrast agent was not administered in any of the cases. Two neuroradiologists interpreted all of the MR images of this study electronically on the MR imaging console monitor. Measurements of the pineal cysts also were done electronically on the MR imaging console with the scanner vendor-provided standard MR imaging software. The internal structure, MR imaging signal intensity, and margins of the cysts were evaluated as well as the mass effect of the cyst on the adjacent midbrain structures, including the aqueduct of the midbrain and the superior colliculi of the quadrigeminal plate. Categorizing the cysts according to their cross-sectional inner diameter and setting a 2.0-mm criterion, we divided the cysts into small cystic changes (<2.0-mm diameter) and pineal cysts (>2.0-mm diameter). Two millimeters was used as a cutoff criterion for the pineal cysts because the smallest reported pineal cyst in MR imaging studies was 2.0 mm.8 Finally, follow-up MR imaging scans were performed on 2 subjects, one 8 years and 7 months and the other 9 years and 9 months after the initial scans. On the MR imaging, the pineal cysts were sharply delineated, ovoid-shaped lesions in the pineal gland, without intracystic trabeculations. Their MR imaging signal intensities on both the T1WI and the T2WI were similar to those of the CSF in the ventricles. We observed the prevalence rate of the cysts to be 23% (9 women and 14 men in 100 healthy volunteers), with a slight female predominance (9/30 women vs 14/70 men). However, the female predominance was not statistically significant (P = .054). The mean of the largest inner cross-sectional diameter of the cysts was 4.3 mm, with a range of 2–14 mm. Thirteen percent of the subjects (8 men and 5 women) had small cystic changes (less than 2.0 mm in diameter) in the pineal glad that also were isointense on the T1WI and T2WI relative to the CSF. There was a slight female predominance in the cystic changes (5/30 women vs 8/70 men), again without statistical significance (P = .74). However, for the combined presence of cysts and cystic changes observed, a female predominance was statistically significant (14/30 women vs 22/70 men, P < .05). The typical pineal cyst and cystic changes are shown in Figs 1 and 2. In 2 of the 36 cases, the pineal cysts touched the superior colliculi of the quadrigeminal plate without causing any deformity. However, there was no evidence of an obstructive hydrocephalus or of a narrowing of the aqueduct. All subjects with and without pineal cysts were completely asymptomatic. Large pineal cyst in a healthy 38-year-old man. A, Sagittal noncontrast T1WI (gradient-echo; TR/TE/flip angle = 24 ms/6 ms/25°). B, Axial T2WI (fast spin-echo; TR/TE/echo-train length = 4200 ms/128 ms/14). C, Sagittal noncontrast follow-up T1WI, 8 years and 7 months after initial scans. D, Sagittal noncontrast follow-up T2WI, 8 years and 7 months after initial scans. The arrows indicate the pineal cyst. The pineal cyst touches the superior colliculi of the quadrigeminal plate without causing any deformity. However, no evidence of an obstructive hydrocephalus or of a narrowing of the aqueduct of the midbrain is seen. Small cystic change in the pineal gland of a healthy 25-year-old man. A, Sagittal noncontrast T1WI (gradient echo; TR/TE/flip angle = 24 ms/6 ms/25°). B, Axial T2WI (fast spin-echo; TR/TE/echo-train length = 4200 ms/128 ms/14). The arrows point to the cystic change in the pineal gland. Two subjects with large pineal cysts had follow-up scans, one 8 years and 7 months after and the other 9 years and 9 months after the initial scans. The largest inner cross-sectional diameters of their cysts were 8.6 mm for one and 12.9 mm for the other. They have been completely asymptomatic during the follow-up period, and their pineal cysts did not change in size, signal intensity, or internal structure on the follow-up images (Fig 1). Physiologic calcifications in the pineal gland are very common and vary with age.26 Although they have both low and high MR imaging signal intensities on the T1WI,27–29 they should be hypointense relative to CSF on the T2WI because of the T2 relaxation shortening and the low proton attenuation in the calcifications. Because the MR imaging signal intensity characteristics of the cysts and the cystic changes demonstrated in this study were similar to those of CSF, pineal cysts, and cystic changes should not have been confused with pineal calcifications. Our study demonstrated that there is a slight female predominance in the occurrence of pineal cysts and pineal cystic changes, which is consistent with the results of prior retrospective MR imaging studies conducted for other medial indications5–6; however, a female predominance was not shown in the prior study of healthy subjects.17 One possible explanation for this difference could be the relatively small sample size in the other study's healthy group, with only 2 cases of pineal cysts identified in 27 subjects. In addition, this difference could be related to the method of patient recruitment. Further study may be warranted to address this difference with a large healthy subject population. The most important implication of the high prevalence of asymptomatic pineal cysts in healthy subjects demonstrated in this study is that no surgical intervention or imaging follow-up is warranted for such cysts because 23% of healthy subjects have such cysts, and primary intracranial tumors in the pineal region represent only 1.0% of all intracranial tumors.26 Small pineal cysts should be treated as normal variants, especially in female subjects, because of the slight female predominance in pineal cysts and pineal cystic changes. 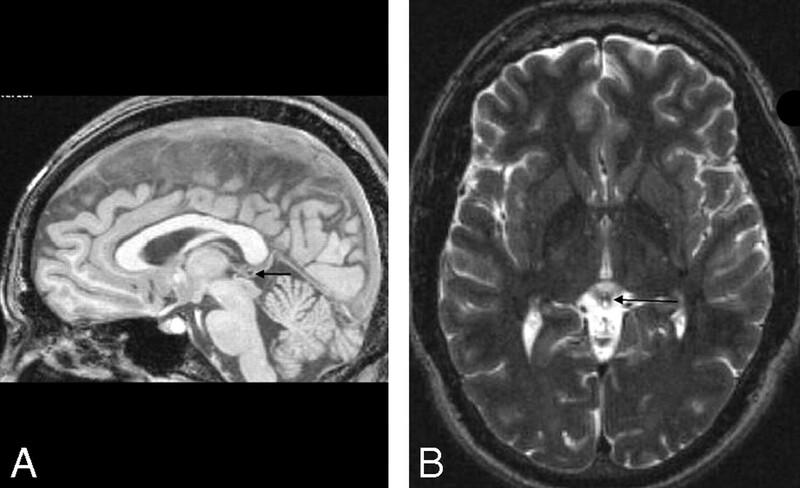 The prevalence of asymptomatic pineal cysts in healthy adults on high-resolution MR imaging is 23%, which is consistent with previous autopsy studies. The stability of pineal cysts was demonstrated in 2 of the subjects on follow-up studies. This study suggests that further work-up, imaging follow-up, or therapeutic intervention is unwarranted for small and asymptomatic cysts in otherwise healthy adults. We are grateful to Dr. Lin Xiong for proving follow-up MR images. This research was supported by the Human Brain Mapping Project jointly funded by the National Institute of Mental Health and National Institute on Drug Abuse (9 P01-EB001955-12). Previously presented in part at: Neuroradiology Education and Research Foundation Symposium 2006 and Annual Meeting of the American Society of Neuroradiology, April 29–May 5, 2006; San Diego, Calif. Accepted after revision March 12, 2007.